Story Maps are immersive web applications that tell the incredible stories of the Library’s collections through narrative, multimedia, and interactive maps. The story maps are created within a Geographic Information Systems (GIS)-based software platform created by Esri. Story Maps are chock full of primary sources, including photographs, illustrations, texts, newspaper articles, and even maps. How can you integrate story maps into your curriculum? Holy Land Photography, by Adam Silvia, Prints and Photographs Division. Journey across the Middle East with English photographer Francis Frith. This Story Map includes 19th century photography and written testimony from Sinai and Palestine, a photographically illustrated book by Frith at the Library of Congress. This downloadable CSV file provides the mapped data in this Story Map. Camera and Locomotive, by Micah Messenheimer, Prints and Photographs Division. Explore the parallel histories of photography and the transcontinental railroad. Objects in the Library of Congress collections tell the story of the fascinating interconnections between the two technologies. This downloadable CSV file provides the mapped data in this Story Map. Maps That Changed Our World, by Julie Stoner, Rodney Hardy, and Craig Bryant, Geography and Map Division. Using the collections of the Geography and Map Division at the Library of Congress, this Story Map will explore the changes in world maps throughout the centuries and how as a result, perceptions of the world have shifted. This downloadable CSV file provides the mapped data in this Story Map. A Treasure Trove of Trials, by Francisco Macias, Law Library of Congress. This is a story map is centered on a digitized selection of Law Library of Congress piracy trials. This collection is critical for understanding how various nations of the world handled piracy issues before the year 1900. This downloadable CSV file provides the mapped data in this Story Map. Surveying the South, by Kristi Finefield, Prints and Photographs Division. Noted architectural photographer Frances Benjamin Johnston created a systematic record of early American buildings and gardens called the Carnegie Survey of the Architecture of the South (CSAS), primarily in the 1930s. This downloadable CSV fileprovides the mapped data in this Story Map. 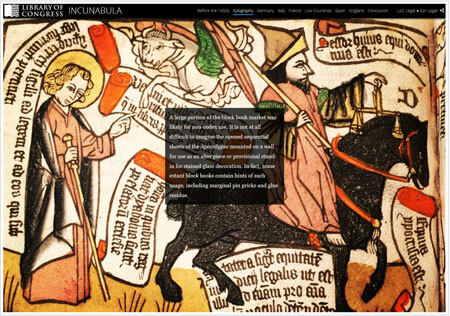 Incunabula, by Stephanie Stillo, Rare Book and Special Collections Division. This Story Map will explore major themes in fifteenth-century (incunabula) printing, including: the transition from manuscript to print, early hand-printing methods, the invention of typography, and the integration of woodcut illustrations with type. This downloadable CSV file provides the mapped data in this Story Map. Behind Barbed Wire, by Chris Ehrman and Heather Thomas, Serial and Government Publications Division. A unique glimpse into the daily lives of Japanese-Americans in internment camps during WWII through the digitized collection of internment camp newspapers at the Library of Congress. This downloadable CSV file provides the mapped data in this Story Map.